This is the second part of our 4-part series “Hip Dysplasia in Dogs”. In this part we’ll focus on the diagnosis and treatment of hip dysplasia. How is the disease diagnosed? How to treat it? What options are there? Read the first part, ‘What Is Hip Dysplasia in Dogs – Causes & Symptoms‘, if you haven’t already. If you notice any signs of hip problems on your dog, it’s imperative to pay a visit to your vet for a complete examination as soon as possible. Hip dysplasia in dogs is normally diagnosed by a complete physical exam and X-rays of the hip joints. Your veterinarian will observe the dog as it moves, stands and sits to check for characteristic signs of hip problems. 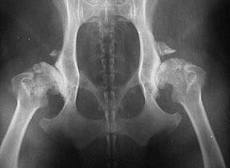 If a dog has noticeable signs resembling hip dysplasia or arthritis, any changes in the dog’s hip joint will be apparent on an X-ray. The vet will also check to see if there is looseness in the dog’s hip joints. The dog may also display pain when the vet extends and flexes its rear legs. In order to get the best result from an X-ray and make certain that the dog’s muscles are relaxed, the vet may need to anesthetize the dog in order to take the best pictures of the dog’s hip joints. After reviewing the X-rays, the veterinarian will compare the dog’s hip or hips to healthy dogs of the same breed and age. When a dog is diagnosed with hip dysplasia using X-rays, the vet can determine whether the disease is in a mild, moderate, or severe stage. ⇒ Read more about hip dysplasia stages and X-rays in this article by James M. Giffen, MD and Lisa D. Carlson DVM. Treatment of hip dysplasia is both medical and surgical. There are several surgical procedures available to treat hip dysplasia in dogs. The type of surgery will depend upon the age and size of the dog, and the severity of its hip joint degeneration. • Young dogs under one year of age with severe hip problems but no apparent damage to the joints yet will be considered for a procedure called Triple Pelvic Osteotomy (TPO). This procedure involves surgically breaking the dog’s pelvic bones and realigning the joint bones to restore the weight-bearing surface area. This surgical procedure is major and expensive, but has proven to be very successful on younger dogs. It is not recommended for middle-aged and older dogs. In a senior dog, the severity of the surgery can be enough to cause its death. • Total hip replacement may be the best surgical choice for a dog whose disease is a result of chronic hip dysplasia. Total hip replacement can produce a functionally normal joint, stop further degeneration of the joints and help ease joint pain. The existing joint is removed and replaced with an artificial one. If both hips need replacement only one hip will be operated on during surgery and the dog will require as long as three-months of rest to fully recuperate between the surgeries. This is a very expensive surgery but it produces excellent results, allowing most dogs to return to an almost normal level of activity without pain. • Femoral head and neck excision is a procedure in which the head of the femur is surgically removed and an artificial joint replaces the hip. This procedure is used in cases where there is serious degenerative joint disease and total hip replacement is not feasible or the expense of a total hip replacement is unaffordable. The resulting artificial joint will usually be free from pain and will allow the dog to increase his activity but his full range of motion and joint stability will be decreased. Medical treatment includes restricting activity and giving a non-steroid anti-inflammatory (NSAIDS) analgesic such as Rimadyl. There are many pros and cons about giving a dog Rimadyl for hip dysplasia and arthritis pain. As a responsible pet owner, it would be best to research this drug as thoroughly as you can before giving your dog this medication. Painkillers like Rimadyl, or even aspirin, mask pain without addressing the deeper sources of what causes the pain. The biggest risk about giving your dog Rimadyl, is its serious side-effects. Numerous deaths have been attributed to the use of Rimadyl. ⇒ Read more about painkillers’ risks and Rimadyl’s side-effects. A much safer treatment, and one that many owners agree is more effective, is to put your dog on a daily regimen of Winston’s Joint System, an all-natural formula developed by a Naturopathic Doctor to heal his own beloved dog who suffered from hip dysplasia. For more than 20 years this proven formula has been giving relief from pain and stiffness to all breeds and ages of dogs. Dogs suffering from joint diseases such as arthritis, bursitis, osteochondrosis (OCD), hip dysplasia and other degenerative problems with the shoulders, elbows and hocks can experience immediate and long-term relief without drugs through the use of Winston’s Joint System. It is a combination of three, totally-natural whole food supplements. There are no side-effects because it’s all just good whole food. There are no dosage problems to be concerned with because the dog’s body will use only what it needs. Dogs now using Winston’s Joint System are showing results that are truly remarkable. Because of the high cost of corrective surgeries, non-medical treatment of hip dysplasia is often the only realistic option for pet owners.